Sometimes you just need a cookie, right?! If you know me, you know that I love baking and making treats. Cookies are one of my favorite things to make because they’re so easy and fun! You can really come up with fun and interesting combos by playing with the ingredients and swapping in different things like nuts, chocolate chips, fruits, etc. 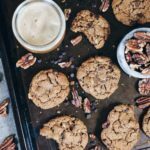 These chocolate chip pecan cookies have quickly become a personal favorite and a crowd pleaser, too! Part of the draw of cookies for me is that they are easy to whip up and take only about 20 minutes to make. There’s just something about the near instant gratification of a treat! 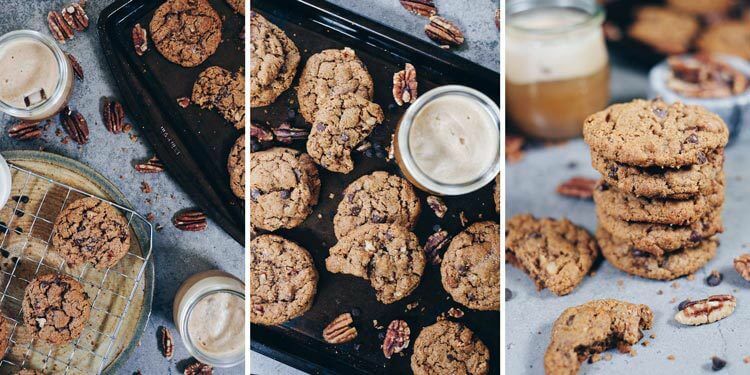 These chocolate chip pecan cookies are made with one bowl and less than 10 ingredients, so they are truly uncomplicated. If you are already eating Paleo, then you also probably have all of the ingredients on hand already! 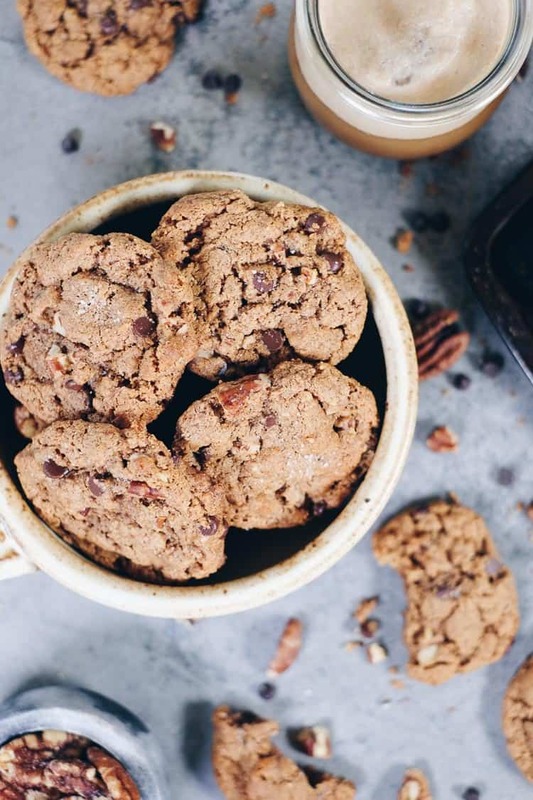 The texture of these chocolate chip pecan cookies is pretty great! If you make them a little bigger they are soft and chewy, with hints of savory, salty and sweet goodness! If you make them a little smaller they are soft and chewy in the center, but a little crumbly around the edges, so plan to play with the size a bit so that they come out just how you like them. Salty-sweet is my favorite combo, especially when it comes to treats! 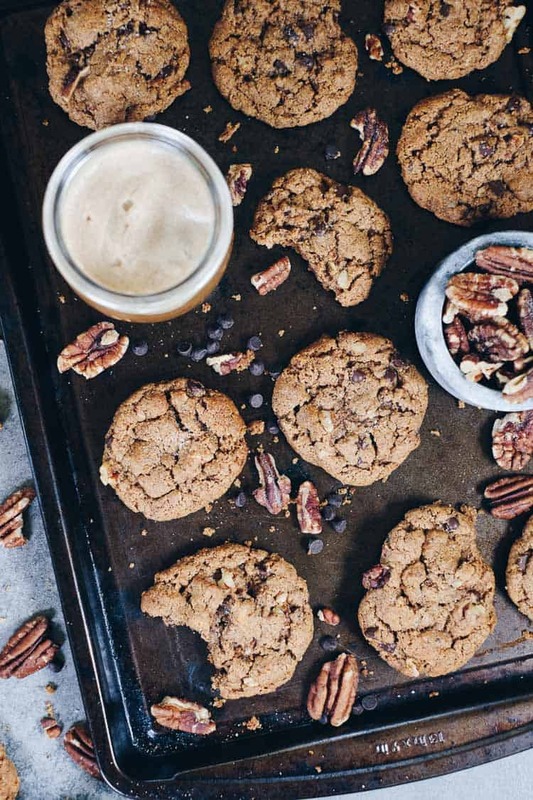 These chocolate chip pecan cookies are basically the best combo of savory, salty and sweet. The batter itself has a hint of sweetness from the coconut sugar, and then the bites with chocolate chips have a little more sweet in them. The best part though is the savory pecans mixed with the sweetness, and then the sprinkle of sea salt on top. The sea salt with the sweetness just makes me swoon. The texture with the flavors is pretty much perfection! Looking for the perfect salty-sweet treat? 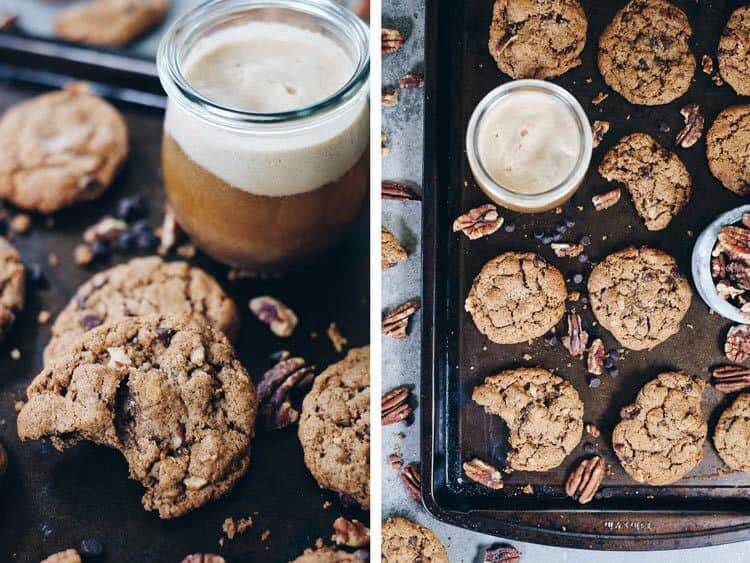 Try these chocolate chip pecan cookies. They’re quick and easy to make and your non-Paleo friends and family will even enjoy them! Let us know how it goes by leaving a comment below. Also, take a photo and tag us on Instagram @realsimplegood, so we can check it out! 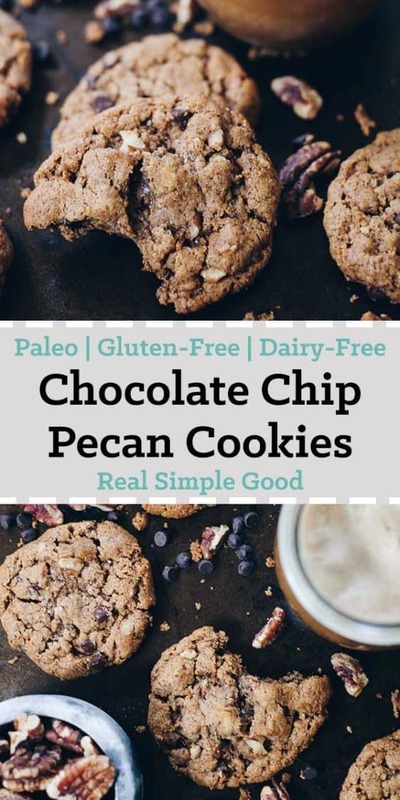 These Paleo chocolate chip pecan cookies are the perfect combo of salty and sweet, and easily a crowd pleaser! Gluten-Free + Dairy-Free. Preheat oven to 350° Fahrenheit, and line one large or two medium sized baking sheets with parchment paper. In a large mixing bowl, whisk egg. Add almond butter, coconut sugar, cinnamon, vanilla and baking soda. Use a large spoon to mix until batter forms. Stir in chopped pecans and chocolate chips. Scoop tablespoon sized dollops onto parchment lined baking sheets. Sprinkle a bit of sea salt on top of each cookie. Place in the oven and bake for about 10 minutes or until the edges start to brown. Let cookies cool on the pan for at least 5 minutes before removing from baking sheets. Store in an airtight container at room temperature for up to a week.